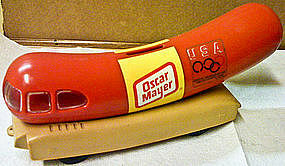 1992 Wienermobile bank. It still has the USA Olympic sticker. There is no structural damage, but there are a few light scratches to one side from storage. Complete photos of condition by email. I need your zip code to calculate the postage.